"Competitive integrated employment refers to jobs held by people with disabilities in workplaces where the majority of employees do not have disabilities; where they earn wages consistent with those earned by workers without disabilities performing the same or similar work; where they make at least minimum wage; and where they are paid directly by their employer rather than through a human service agency." 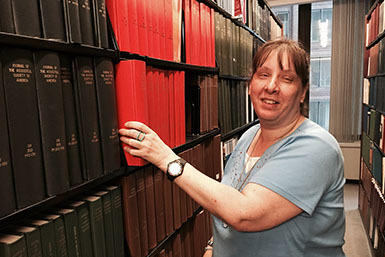 After an internship sponsored by the MA Commission for the Blind, Julie has maintained a full time case manager position at a major Boston hospital. The Workforce Innovation and Opportunity Act (WIOA), signed into law by President Obama in 2014, makes significant improvements in federal law for Americans with disabilities by helping to ensure that all people have opportunities to acquire the skills and training needed to maximize their potential and enter competitive integrated employment. 3. Presented, as appropriate, with opportunities for advancement that are similar to those offered other employees who are not individuals with disabilities and who have similar positions. Dale Deleo noted the evolution of human service employment models for people with disabilities in his article Moving Beyond Place Then Train (2014). When supported employment first challenged the practice of sheltered workhops over 25 years ago, it represented a shift in thinking, from Train and Place to its opposite -- Place, then Train. The traditional model of training people in congregated workshops with the hope that they would someday be ready for employment wasn’t working – too many people never actually got jobs, and people with disabilities were segregated from rather than integrated with other employees in the workplace. • Ongoing networking and employer engagement to identify critical talent needs and hard-to-fill positions, and establishing relationships with employers who welcome the potential of a qualified talent pool. • Typical career planning processes and vocational assessments used by Career Centers and Human Resource professionals for all employees to help individuals identify their chosen career paths that align with critical local job opportunities. • If needed, provide support for candidates to get credentials that will qualify them for those positions, through established relationships with existing career pathway programs at community colleges and industry recognized training programs. • If necessary, address any additional barriers such as transportation or accommodation needs through cross-agency partnerships and alignment with critical services in the local area. • Offer training and guidance to employers and co-workers to help them understand the value and approaches to diversifying their workplace. “Match and Support takes the place of Placement and Training. Placement implies something we do to people, rather than assisting workers with disabilities to be hired successfully. Matching is a more facilitative approach. Like a good headhunter or dating service, you want to bring together people and workplaces where there is a good fit, then help make the magic happen by negotiating a Job Match. This includes job analysis, customization of tasks, and helping arrange accommodations and other needs. Once a job has been brokered, workplace Support and training strategies focuses on natural supports and building co-worker relationships to facilitate learning and assistance from within the work environment…..Place and Train too often turns into “Place and Pray,” which is no way to ensure high rates of job success.” - Moving Beyond Place Then Train, January 29, 2014, www.daledeleo.com.